MOST Rolls-Royce motor cars are burdened with cumbersome closed coachwork. So when I heard that as an apprentice exercise the Triplex Safety Glass Company had rebuilt a 1924 Silver Ghost and endowed it with a replica boat-decked open body I asked if I could try it. Thus it came about that one bleak and blustery January morning I drove to the "Cotswold Gateway" Hotel, to rendezvous with the Triplex PRO John Passmore, our photographer, and the Rolls, which its cheerful and enthusiastic driver Willie Johnson had brought down that morning from Birmingham. A quick inspection of this handsome white-and-mahogany sporting Silver Ghost showed it to be an S-series chassis, No. 48EM, built in 1924 and apparently equipped originally with front-wheel brakes, an innovation from Derby that year. 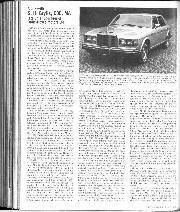 Much of the fascination of Rolls-Royce ownership stems from tracing the history of a particular example; supplied as new to the Duchess of Wherever, for instance, provided with a body to her individual requirements by one of the great coachbuilders of the day, left in her will to the chauffeur who, after a discreet interval, disposes of it to the under-gardener, who uses it for carting manure until it seizes up from neglect, to go to the local scrapyard, from which it emerges in due time to be converted into a breakdown vehicle for Joe's Motors or a coffin-carrier for the village Undertaker—and, I might add, arriving at Sotheby's with replica body, at a later decade, where bids of up to £10,000 are expected. . . . In the case of the car with which we are now concerned, its history cannot be traced. When the Triplex Chairman, Mr. Barry Heath, DFC, asked his Northern Area Sales Manager, Roy Broderick, to find him a suitable vintage car for the rebuilding project, this Rolls-Royce was found in sorry condition at an Aughton cement works, wearing a hearse body and a London registration number. That was in January 1965. 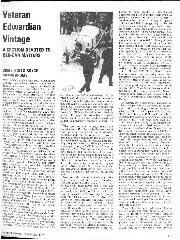 A Morris van towed it to the St. Helens works, where the body was scrapped and the chassis completely stripped. The crankshaft had only 1 1/2 thou. wear but all the bearings were cracked. The local Halewood Engineering Ltd. remetalled these and hand-fitted them to the crankshaft. The two cylinder blocks were resleeved and bored out to take the original pistons. New bronze valve guides were made in the Triplex fitting shop; the valve stems were found to vary in size, so they had to be individually matched to the guides. Many other engine parts were made in the fitting shop and the chassis overhauled in the time-honoured fashion, Ferodo supplying new linings for the 12 brake shoes and the cone clutch and new king-pins being machined from an old AEC axle shaft. Cary Ltd. reset the front springs and tempered the rear cantilevers. The gearbox and back axle were discovered to be in excellent condition. The Triplex painters did much hard work rubbing down the chassis and giving it several coats of white enamel, and the apprentice electricians did a fine task of completely rewiring it. J. J. Webster Ltd. of Buxton were able to help with fuel feed data and carburetter settings after new petrol piping had been installed. Co-operation by fitters, blacksmiths, welders, joiners, plumbers and painters, etc., saw the chassis running by 1966. The working chassis was taken on a Leyland truck to the King's Norton Triplex factory, where a body was to be made for it by their own joiners. A sketch of a four-seater boat-decked tourer on a Delage chassis was found in the IBCAM library and I/2-scale drawings of it were prepared. When, after some difficulty, suitable English ash and mahogany had been located a start was made in the summer of 1966, neoprene strips insulating the bottom body members from the chassis. After some setbacks due to age of the resin glue used, the body frame was completed by April 1968. Auster supplied vintage brass sections and corner pieces for making a four-pane screen, a stainless steel hood frame was constructed, and hood sticks made of alternate laminations of ash and mahogany. The aluminium panelling, trimming and painting was entrusted to A. B. 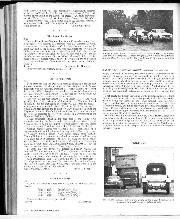 Price Ltd., approved R-R coachbuilders, and another resuscitated Silver Ghost was on the road. This commendable rebuilding has resulted in a very original-looking car. Shod with Dunlop 700-21 tyres, with a spare on each side, and wearing Rudge-Whitworth transfers on the hubs of its wire wheels, the chassis is well suited by the 3-door body, with mahogany tool boxes, forming rear steps, sunk in the running boards. It has an outside handbrake, low-mounted Lucas headlamps, mudguard-mounted Lucas sidelamps, twin Toby Baxter rear lamps, a pair of ship's ventilators on the wood-panelled scuttle, and AA and R-REC badges ahead of the classic radiator. The dashboard layout will be familiar to all Silver Ghost fanciers. From I. to r. there are an 8o-m.p.h. AT speedometer, the neat plated lever controlling the starting carburetter, the similarly-plated central Lucas switch panel, a Weston ammeter, the oil gauge calibrated to 30 lb./sq. in., a petrol gauge rather alarmingly marked 0.1.2.3, representing quarters of the 21-gallon tank, and the big but discreet plated fuel pressure air pump. A plated horizontal dashlamp provides illumination. Nor is there anything unfamiliar to R-R owners about the controls cluster above the 4-spoke, wood-rimmed steering wheel. On the left is the Governor lever, labelled FAST, SLOW, at the top the tiny Carburation lever you can set to "Weak" or "Strong", and on the right the Ignition lever for the traditional EARLY or LATE timing. The massive gate for the short r.h. gear-lever is stamped with the 1,2,3,4 and R positions. A Deva fire extinguisher is carried. Starting the car from cold involved chauffeur or owner in quite a lot of exercise. First the mixture control would be set to "Strong" and the starting carburetter control set correctly. Then the petrol tap on the o/s chassis side-member would be turned on, after which you went round to the n/s, where the Power Pump selector is found on the side-member, and put this to "Hand Pump". Then it was round the car again to pump up pressure. Once the engine was running you set the pump control to "Power Pump" (it also has provision for "Both Pumps" and "Release" pressure), after which no more attention was needed until the next cold start. Close to the chassis petrol tap is a lubricator marked "Every 500 miles", which is obviously important. But the early Silver Ghosts had 43 separate oiling procedures, some involving more than one oiler, which had to be attended to every 250 miles and were calculated to occupy an efficient chauffeur for a total of 1 hr. 56 min! Fortunately our Silver Ghost was warm from its long run to meet us and presumably was well lubricated, so an instant start to our journey was possible. 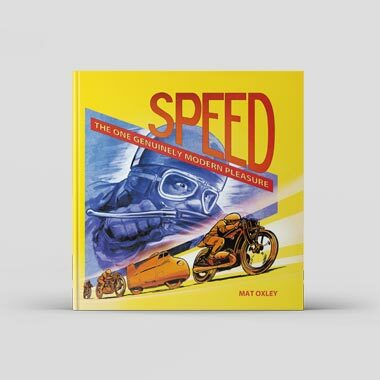 The driver climbed in through the n/s door and fastened his safety belt, I got in, and we were away, in lofty dignified style, for all the world as if we had put the clock back 46 years, when the Duchess' skirts were at ankle level and the Land Speed Record stood at 146 m.p.h. Soon we were climbing over the Cotswolds at a steady 40 m.p.h., speed rising on the level to what I thought was 50 m.p.h. (the speedometer apparently reads 7 m.p.h. slow) but which the Rover pacing us gave as 57 m.p.h. I gather that this stately Silver Ghost goes with even more abandon when Motorways enable it to build up its reserves. Anyway, here we were riding high, steady and comfortable, the oil gauge at 24 lb., the dynamo charge a healthy 12 amps. and needing to be switched off from time to time to prevent the battery fluid from boiling, and the smartly-gaitered cantilever rear springs which support some 21 tons of motor car doing so without roll as sharp downhill corners were negotiated with quite a dash of panache. It was motoring in a grand if somewhat pedestrian manner, accompanied by that subdued rumble of machinery which is, I think, a characteristic of vintage Silver Ghosts. You look down on the shapely bonnet and broad mudguards, the Silver Lady (I beg your pardon—the "Spirit of Ecstasy") upstanding on the distant radiator cap. It began to rain but in spite of there being no side-curtains the occupants kept quite dry, perhaps due to the air flow round the screen—the absence of screen-wipers was a far more irritating factor. After pausing for photography our plan of driving to Ledbury for lunch was abandoned and we turned back, in a heavy downpour. It was then that I took the wheel, to assess the joys of Silver Ghost motoring at first hand. The 7.4-litre engine pulls top gear well and will restart on a 1-in-6 hill in 2nd gear. 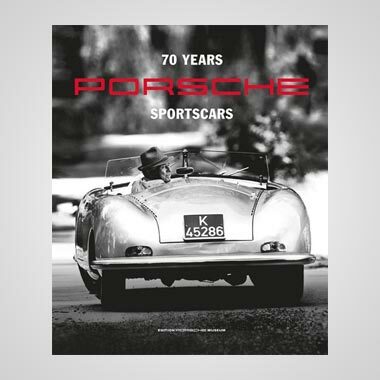 The car handled easily but was more sluggish than I had anticipated, although this was no doubt less apparent in that leisurely age in which the Ghost was conceived. The mechanicalservo brakes were decidedly good, even on 1-in-12 down gradients, with no lag; the steering was positive, with no kick-back. But there were two disappointments. The first concerned the R-R governor. In spite of studiously reading R-R handbooks I have never been able to fathom its purpose or comprehend the tricks they say could be played with it. Now, I thought, I shall learn. But all it turned out to be was an outside hand-throttle. Then there was the gearbox. Try as I might, using lots of revs or scarcely any revs when double-declutching, I just could not make silent changes from top to 3rd. My blushes were spared because Willie, our driver, clearly had the same difficulty, tending to punch 'em in and even coming to rest on more than one hill after funking a change-down. 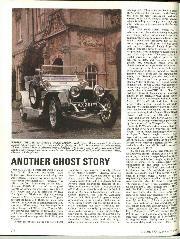 The gear-change of a 3-litre Lagonda may be tricky; that of this Silver Ghost defeated me. But even had I mastered it, with more experience, I should still have disliked the long movements of the gear-lever and the tedious business of having to exert sideways pressure on it before the gears can be disengaged (a R-R safeguard against knocking the lever out of gear). The rain increased, so I gave up the ghost at Stow-on-the-Wold, had lunch, and went home. But, brief though it was, this encounter with the Triplex Rolls-Royce had been a worthwhile experience. 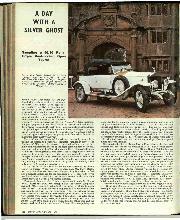 I am not so fanatical about the Silver Ghost as most writers and had I been a member of the affluent Society when it was in production it is likely that I would have purchased some other make. Yet the magic, of more than the name, undoubtedly exists. A production-run spanning to years, from 1907 to 1925, with 6,173 sold, is not to be denied. 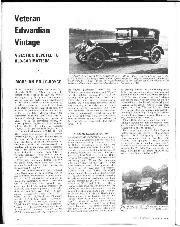 And today there are those who will pay £10,000 or more for a pre-war model, when for such an outlay they could buy a Silver Shadow and sufficient petrol to drive it some 40,000 miles. Is it that Edwardian Silver Ghosts were even quieter—"pulled along by an invisible piece of string"—quicker, than those of the vintage years? Or is it that these high bidders never intend to drive the cars they acquire ... ? That apart, the Triplex rebuild is highly commendable and I think they were wise to decide on open bodywork, which has the twofold merit of being very handsome and rather unusual. But this Rolls-Royce is no showpiece, in the static sense of the term. 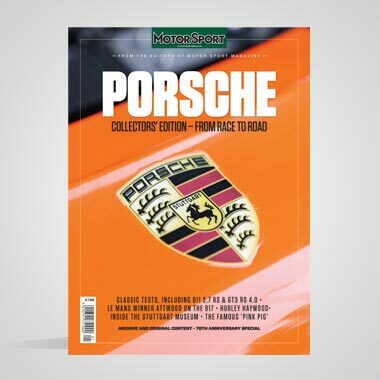 It covers considerable mileages, and ran in last year's Blackpool-Manchester Rally. I was told that it gives about 11 m.p.g. of 90-octane petrol, did rather better than this during the aforesaid rally, and thrives on Castrol GTX in its sump and Redex in its gearbox. Had the weather not deteriorated my day with a Silver Ghost would have taken us further afield and I should have gained more knowledge of this impressive-looking motor car. As it was, Willie set off that afternoon to drive it to Lancashire. 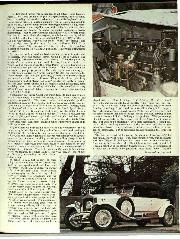 Which proves that Triplex have complete confidence in this 1924 car which they have rebuilt so painstakingly.-W.B.